5 Favorite Inspiration Pins - kitchen edition | House Unseen. Life Unscripted. In the combox of yesterday's post filled with before pics of my poor, distressed in a bad way not in a hip way, kitchen, Charlotte suggested I talk about all the wonderful and fantastic ideas I have for the new and much improved kitchen to get my mind off the blah. Why don't I go ahead and troll my own Pinterest boards so you can daydream alongside me? This we pinned because we love the dark hardware against the white cabinets but also the way the white looks with the distressed brick. Won't it be awesome if we can make those built-ins + that cheesy brick look more like this? Also: hardwood floors. Shaker style cabinets. I likes dem. But not the varied lines on the upper cabinets. I prefer them to go straight across to mimic the straight lines of cabinet fronts. Also, yes to the stainless steel sink instead of ceramic as the current sink is ceramic and we have broken more dishes on that unforgiving surface in the last three months than we have in the last 14.62 years combined. And look! We can make the existing built-ins match the new cabinets by cleverly turning them into shaker style and then painting them to match. Berry berry schneaky. Ah. Isn't it lovely? So lovely. I'm all about that colorful backsplash and doesn't the turquoise door there reminds you of the door in the laundry/mudroom? I'd love to do tile like that, but we're going to try and match the original hardwood floors in the living room instead so that we don't have such a mish-mash of different flooring materials happening up in this piece. Mas y mas y mas y mas y mas? Aqui. p.s. We are torn on the appliance question. That question being: white or stainless? I think that white is more timeless and pays more of an homage to the 1930s kitchen that was here so many years ago, but there are way more options in stainless right now and since we need a counter depth fridge and would like it to be french door style, minimizing our selection is probably a dumb idea. I don't dislike the way stainless looks by any means I just don't know if it's the better choice in here or not. Feel free to pour forth your wisdom below, functional-kitchen owning humans. White cabinets? Dreamy. I love white kitchens. Maybe I shouldn't have had kids? Meh. Who am I kidding? We have a white dining set and the pb&j finger prints really set it off. Totally worth it! Eeeee you have my style! 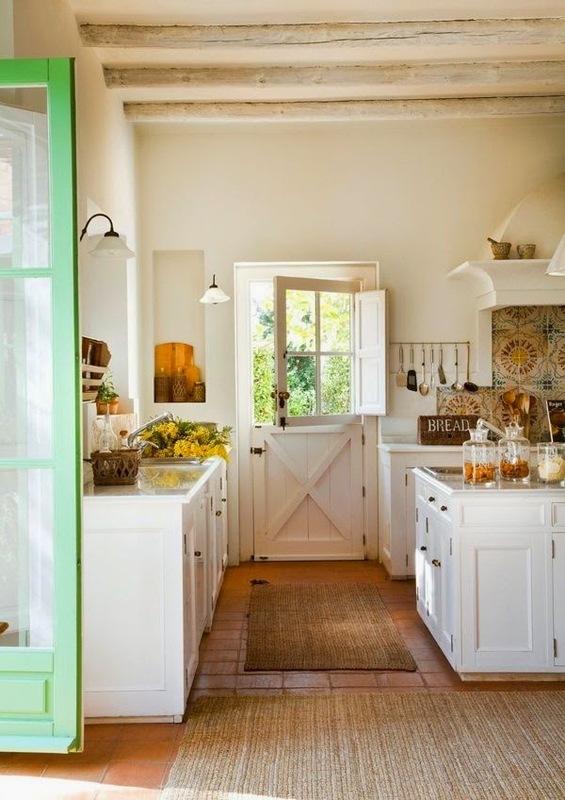 I love the Dutch door in that last picture as well. Where are you thinking of getting cabinets? Ikea just released their new line and I confess to being kind of underwhelmed but they are definitely the cheapest I've found and supposed to hold up well. Love the ideas for your kitchen, but have to comment on stainless versus white. We moved into a house with stainless (I've never thought to buy it because...more expensive, and you know I'm all about the cheap). My two biggest beefs...ALWAYS is smudged/fingerprinted/dirty. I thought it would be cleaner lines, and I'm fine with every appliance, but the fridge. Unless I want to wipe down the door 43,284 times a day, it looks bad. Second problem, NOT MAGNETIC!!! I have to use tape to put things on my fridge, like the spelling list, or the meal planner that tells my husband what we're having for dinner. This is my #1 issue. Make me a stainless fridge that can hold magnets on the front and I might just buy it, but probably not. You know, it's odd...I have friends who have a stainless refrigerator that isn't magnetic, either. But mine, as well as my brother's... is magnetic. Very weird. Also, yes, it does get smudgy, but I find that wiping it down with a rag is the perfect chore for my 3 and 6 year olds. We had a fake stainless steel fridge in our last house and a real one in our new house. The fake was magnetic and didn't smudge very easily. It also cleaned up with regular Mrs. Meyer's Clean Day, but the real one requires a special cleaner. Can you get faux stainless steel? Also, white is supposed to be coming back in, but I'm yet to see it embraced. I don't mean to make it sound like white would be bad. I just haven't actually seen people buying it when they have the stainless steel option. 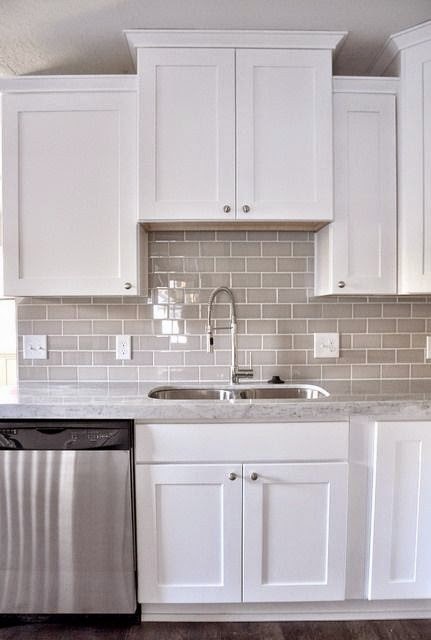 I do think white is 100x easier to clean and looks pretty good in a kitchen with white cabinets. Pledge works on stainless steel! I personally prefer white appliances, and there are some new options in white (it's called something fancy like 'frost' or something) that are really nice and modern. Stainless steel looks good new but that's the last time it looks good, lol! There's just too many smudges. I don't think it would mess with the look you're going for in the kitchen but I do think the white appliances would be more fitting. BTW I LOVE all your inspiration pics! White shaker cabinets with dark hardware is my absolute fav. Unfortunately our oak cabinets are new so DH says I can't paint them white since they're 'perfectly good' as is. Oh and I definitely love the colorful backsplash and door too! My daughter went with stainless. 1. the fingerprint issue is unbelievable. 2. First day in a toy got in close proximity and there is a huge noticeable dent front and center. 3. I don't know the science - but she can't put magnets on hers. Just my 2 or 3 cents worth. We have stainless for our fridge and dishwasher..... HATE the constant finger prints, and water drips and everything showing up. Also scratches really easy and dents easy too. Our fridge can hold magnets, so its technically supposed to be the easier stainless, but its such a pain to keep clean that it just always looks gross. Bummed. White appliances are also more economical than stainless, if I remember. I love all your pics! We have a white kitchen that we remodeled a couple of years ago and I love it. I love the kitchen ideas! And the shaker-hack!? I might have to noodle on that one a bit. I whitewashed our brick fireplace this fall and was so scared to do it, but I LOVE how it turned out! The pin you have above is one of the tutorials I used. Ugly brick can be pretty again! Also, for the appliances. Stainless steal is beautiful, but it shows finger prints super easily. I think they might have ones that don't show them as easily now? Not sure though. Something to look into though. 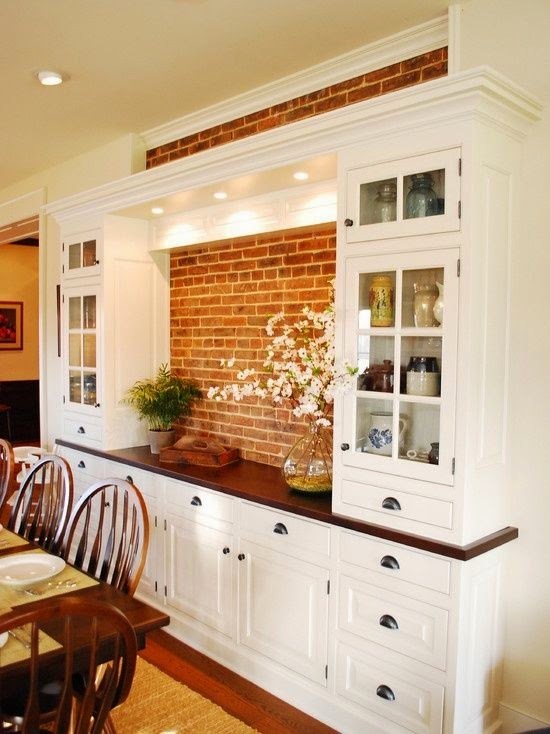 I want the exposed brick kitchen for your house because I can't/don't/won't have one and someone I know (even if it's only in the machine) has to have that in their house so I know real people really have fanciful stuff like that in their homes! We are a family of 7, I have exactly the fridge of which you speak. My 2 cents: no magnets equals non cluttered looking fridge, love. Stainless shows grime, but I don't find it to be super offensive. I love the French door, but find I hate my freezer. You loose a lot of cubic feet of storage with the counter depth, and it is noticeable. But it looks so nice, I'm never going back! I love the look of my stainless but I hate the fingerprints. Baby oil cleans it better than the fancy stinky stuff I bought. We have a dent and no little kids...I think they could take a beating with toddlers. Hasn't thought about that! We have black and stainless except for the fridge because we ran out if money and I inherited it from a cousin. The fridge is white, SO easy to keep clean!! The black and stainless, always a mess even though I clean it fifty times more often. Will never do stainless nor black again. I vote for the third choice: bisque! When our old fridge conked out, I got a bisque (actually a very pale yellowy tan) fridge. It doesn't show the dirt as much. (At least that's my theory.) And it's more restful on the eyes than a blinding white thing, which was my other choice, cuz ain't no way I'm shelling out the bux to buy stainless. Uh uh. And also, I vote for the freezer on the bottom. That way, you aren't always bending down to get the stuff that you use all the time, just to get stuff that you don't use as often. 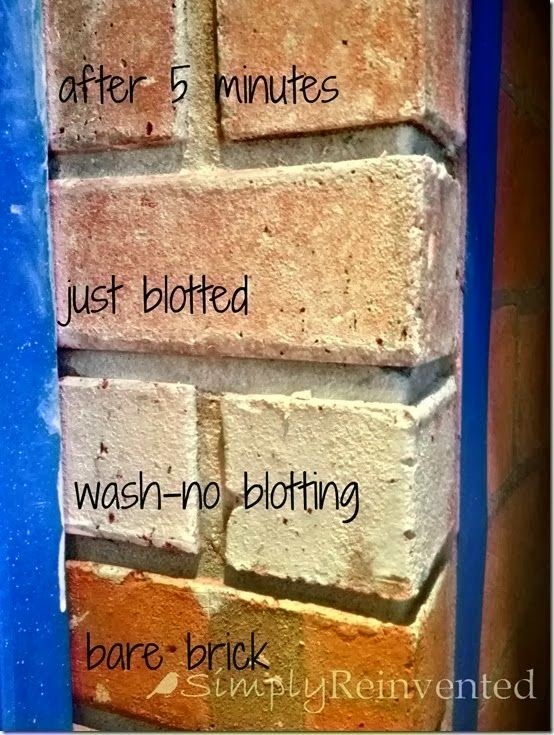 We whitewashed our brick fireplace and it was an amazing improvement! I was so nervous about it but it brightened up the whole room and looked immediately updated. I have a BLACK powdered granite sink which I love. Would buy it again and again. Not expensive at all, from Home Depot. Pretty much scratch and dent proof. Everything else is stainless steel. I vote stainless steel. Just sleek, clean looking, elegant, and not necessarily modern at all. Our house has a very traditional-looking kitchen, and the stainless looks great. Also, it makes you appear to be an excellent chef. One caveat, though, if you haven't before, is the fingerprint situation. After cleaning it once in a blue moon, or more often if you have time, run an old cloth diaper with baby oil (lavender is nice) over the appliances and buff them. The fingerprints just do not want to adhere then, which is awesome sauce. By the way, not wanting to be all grammar police on you, but it's actually 'duct' tape. I think duck is a brand of it, but it's meant for duct work, so there you have it. 'Scuse me while I kiss this guy, you know? Thank you for the "duck" vs. "duct" explanation! I had a suspicion that was the case, but see "duck" used so often ... like "Kleenex". I love all your pins, and the last is my favorite. But I have never had white cabinets, so am not sure about the dirt factor. I do have shaker, and the bottom frame does collect dirt and grime from cooking. We also had a stainless fridge, non-magnetic, and I prefer other styles for that reason, and the white because I think it's warmer than stainless. I have white cabinets and prefer the look of white appliances against them. We just went with a darker counter and backsplash and it really makes the white pop. Love it. Also the stainless sink. My sister has a stainless fridge and while she loves the french door option, she HATES the stainless front - horrible to keep clean. We're currently in the midst of our kitchen remodel. I might share our before pics with you on facebook because we had avocado-green tile countertops with orangey-brown cabinets and stainless appliances, except the dishwasher, which was inexplicably white. And our fridge, which is also white because we haven't had a reason to replace it but it lived in the garage for the first 6 months in this house, only moving inside after the new cabinets arrived. So I have 5 thoughts for you based on your 5 bullet points. 2) There's this grout stuff, wish I could remember the name, but you use a toothbrush to rub it on the grout, which makes it water resistant and changes the color of the grout, depending on your color choice. We used it on our tile shower, which had white tile and it turned our dingy grout bright white! 3) We LOVE our white shaker cabinets! We ended up pairing them with soapstone countertops. If you want pics, I'm happy to show you how each looks against white cabinets. Also, stainless steel is easy to clean with coffee filters. Takes smudges and fingerprints off like nobody's business. Of course, white doesn't have the fingerprint problem, except with dirty hands. 4) Such a great idea! Now I'm trying to think of where I can use that hack! 5) *drool* I LOVE the turquoise door, and also the half door thing, which is incredibly useful for corralling kiddos and dogs. When my family redid our kitchen, we got a stainless steel discount at a huge discount because there were some unnoticeable scratches on the bottom caused by a forklift, so if you see anything like that go for it! I like white appliances. Almost everything is also available in white, you just might have to special order it. I'd rather wait a couple of weeks for the thing I want than settle for the thing I don't quite, you know? We are going with white. There are slightly less options, but those options ARE cheaper. Plus, instead of going with counter-depth (which are oddly a LOT more expensive) I recommend either recessing the fridge (set it back into the wall) or bumping out the cabinets around it (try putting pantry style cabinets on either side a la IKEA). Since you guys are redoing the kitchen (rather than replacing the appliances) either of these options should work. Where's it written that all appliances have to match each other? I have stainless, but it really sounds like white would be better for your fridge, especially. 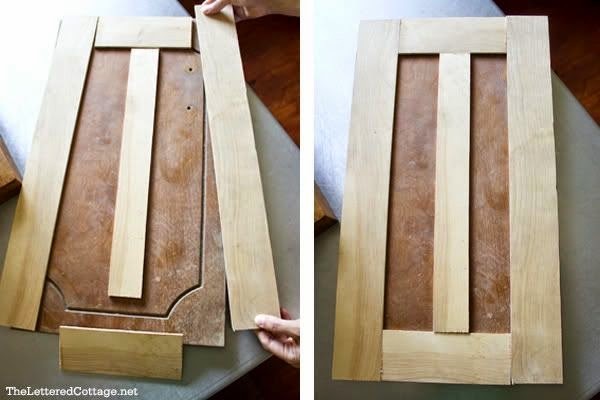 Also, I have shaker doors with dark hardware (love them) and I added a beading to the inside of the shaker frames, if that makes any sense. I still really like the way it looks, and it's been 14 years. Also, I have put hardwood floors in my last two kitchens and they really are not durable. At all. My kitchen is so open to the other rooms that I pretty much had no choice this time, but boy do they get beat up, and need to be refinished. We have bamboo floors in other parts of the house and they are in really great shape despite my dogs racing in and out of the dog door across the bamboo. The last pic is like my dream. One day!! My current kitchen closely resembles #3, so mebbe my landlord was stalking Pinterest when building our suite. It's a nice look in real life too. As for SS vs white, we have SS and all the smudges & watermarks all the time. Doesn't bug me too much, but the one thing that does bug my subconscious is how much it darkens the kitchen area. White would make the small space feel more open.